Google is sending out new Google Search Console notifications for pagespeed related topics. 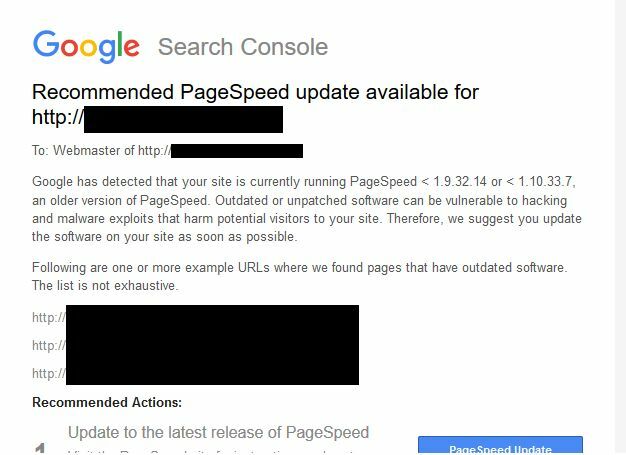 The notification being sent out reads "Google has detected that your site is currently running PageSpeed < 1.9.32.14 or < 1.10.33.7, an older version of PageSpeed." The subject says "Recommended PageSpeed update available for siteURL. It goes on to say, "outdated or unpatched software can be vulnerable to hacking and malware exploits that harm potential visitors to your site. Therefore, we suggest you update the software on your site as soon as possible. Following are one or more example URLs where we found pages that have outdated software. The list is not exhaustive." It then goes on to list some URLs and recommended actions. It seems these notifications began being sent out yesterday by Google. There are folks in the Google Webmaster Forums and people on Twitter reporting this. Google's John Mueller added in the Twitter stream that "sometimes we can recognize what you're running and inform about updates, it's usually less about active exploits." In short, if you are running an older version of the Google PageSpeed module, Google will send you this notification. This has nothing to do with page speed optimization recommendations outside of updating an old mobile from Google. Forum discussion at Google Webmaster Forums and Twitter.